What food is perfect for those endless chatter that young kids are so very good at? 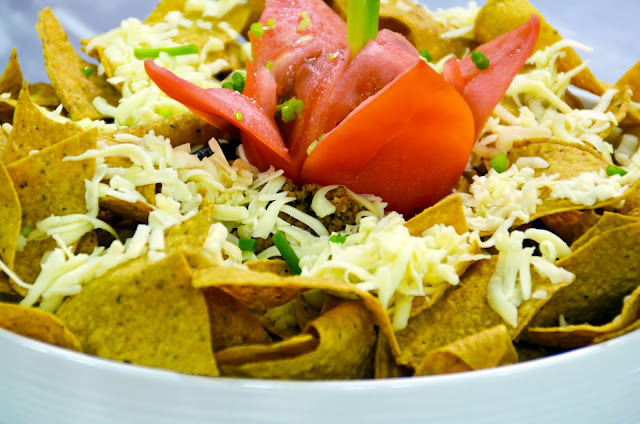 Chef Boy offers Nachos with Chili con Carne. You hardly notice the flight of time when the conversation is good and the food is even better. 1. Sweat onion, garlic, chili and thyme in oil in large saucepan. At same time, brown beef in separate pan over moderate heat in little oil. 2. Add dried spices to onion mixture and cook until they release aroma. Then stir in beef and mix well. Add fresh and tinned tomatoes and leave to cook down a little for about 5 minutes. 3. Pour in chicken or beef stock and stir in tomato puree to taste. 4. Drop cinnamon and bay leaf then bring to boil and leave to simmer. 5. Once sauce is begins to thicken, add kidney beans and leave to cook for another 5-10 minutes to allow beans to soak up flavors. 7. Arrange nachos, spoon a healthy helping into center of nachos. Sprinkle over grated cheddar cheese and grill till melted and lightly browned.